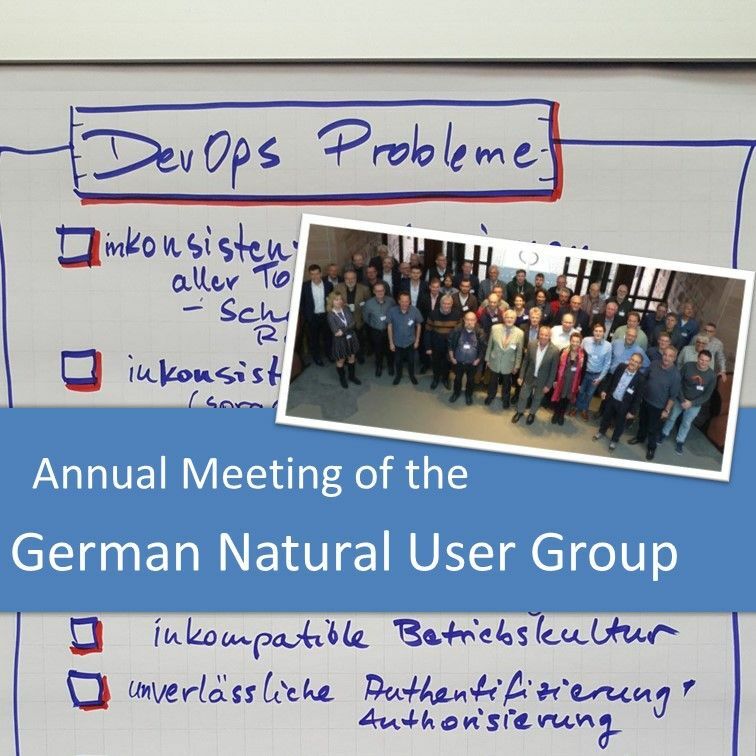 German Natural User Group Meeting in November 2018 - Legacy Coder Podcast #7 - SOA rocks! On November 6th and 7th, the German Adabas and Natural User Group met in Darmstadt at Software AG’s headquarter to learn about new features in the October 2018 release. Let’s find out more in episode seven of the Legacy Coder Podcast. Ca. 60 attendees from all over Germany. Again, there were quite a few “young” Natural developers present including my colleague Markus who presented about NatLint, a linting tool for Natural. Currently, 40% of Natural customers work on LUW, 60% still work on the Mainframe. However, according to a different source, only 1/3 of customers are still on the Mainframe. Many different companies attended that run mission critical systems on Adabas/Natural. Process for finding and defining the underlying problem we need a solution for. Come up with crazy ideas to get your brain moving. Introduce restrictions later to validate ideas for solutions. What are the main pain points Natural customers have with deploying Natural applications? Lots of different versions of tools, source, databases etc. Needed to make Adabas ready for containerization. You need a license for Entire Net-Work, if you need more than 4 connections. Non-Natural clients can also use the interface. The TCP/IP interface is as fast as the native IPC interface, if Adabas and Natural run on the same server. Adabas can now be administered via a REST interface. What’s new in Natural and NaturalONE? Due to “NaturalONE and only” Eclipse is now the single editor for programming Natural. Therefore, many missing features had to be added: access to Natural utilities, Error Messages, SYSEXT etc. NaturalONE is now licensed via Natural server. You don’t need any additional license for NaturalONE on the client, no matter how many developers you have. The Ant build files get additional options. Log output while uploading sources to NDV can now be reduced. Modules are cataloged in the correct order (Data Areas first etc.). Customers can publish their existing Natural modules as services and re-use them in other applications. No new investments are needed and existing assets can be used. REST Enablement of Natural services is now possible via a restricted version of WebMethods Integration Server that’s shipped free of charge for customers that have an EntireX license. Incoming (e.g. calling a subprogram) and outgoing (e.g. external REST services) calls are possible with this solution. Generating services or service stubs is a matter of seconds and only takes a few clicks. Use Case: Run Natural RPC servers on a scalable infrastructure (Docker and Kubernetes). Adabas is not yet ready to be clustered, but Software AG is working on that. My colleague Markus presented the results of his Bachelor’s Thesis about code quality in Natural. He wrote a so called “linter” that checks Natural code for certain code smells, bugs, and security vulnerabilities like unused variables, naming conventions, opening but not closing a work file etc. He uses the Natural parser that’s shipped with NaturalONE. The results of the linting can be viewed in SonarQube but also directly inside NaturalONE. You can also do a few refactorings in NaturalONE with the tool: rename variable, rename subroutine, introduce local variable. April 2019: German Adabas and Natural User Group Meeting at ALTE OLDENBURGER AG in Vechta. June 2019: International User Group Conference in Riga. Present at a User Group in your country! You don’t have to be “leading edge”! Other customers are also interested in seeing what other companies are doing with Adabas/Natural.